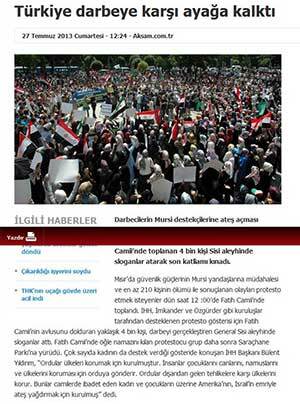 Adnan Oktar: Egypt is paralyzed. There is no industry and tourism. Nothing is left. It is paralyzed. If there is no art or love but there is suffering, terror and hopelessness in a place, than there won’t be industry, wealth or happiness. Let me tell you, there is nothing left. Help as much as you want; that’s like giving blood to a dead person. Even if you give one thousand liters of blood, he won’t rise from the dead. In order to rise from the dead, there must be the Mahdi(as), Jesus Christ(pbuh), Islamic Union. There isn’t any other way out of this. Adnan Oktar: They should use a language that embraces all of the Islamic World. They must always speak of the Unity of Islam, the Islamic Union. “Let us free Egypt, let us free another country…” Rescuing only a region; God will create exiguousness, trouble and afflictions with this. That is all that will happen. God knows better. Adnan Oktar: The solution is the unity of all the Islamic World, THE FORMATION OF A GREAT TURKISH-ISLAMIC UNION UNDER TURKISH LEADERSHIP, FOR TURKEY TO MAKE ITS WEIGHT FELT AS A SUPERPOWER IN THE REGION and to protect and watch over the whole Islamic world as its blood brother, to enable them to grow stronger economically and politically in each and every way, to take the Turkish world, almost all of whom are Muslims anyway, under its protection and to put an immediate end to anarchy as a regional superpower. Taking a step toward a great civilization, we must strive to resemble the time of the Prophet Sulayman (as). That is the solution. Adnan Oktar: The period that lacks a Turkish Islamic Union will remain a painful one. There isn’t any way other than that. The only solution is the Turkish Islamic Union. Postponing this would put people under great difficulty. 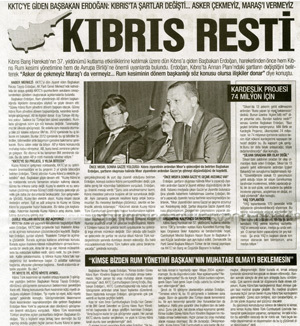 Today, the blood that is being shed in Georgia, or the troubles going on in Abkhazia or the pain felt by the Russians depends on the fact that there has not been a Turkish Islamic Union established. IF TURKEY OFFERS TO UNITE WITH AZERBAIJAN AS ONE NATION BUT TWO SEPARATE STATES, THEY WILL IMMEDIATELY AGREE WITH US IN 24 HOURS, INSHA’ALLAH: THIS IS THE SAME FOR SYRIA AND IRAQ. THERE IS NO ISLAMIC STATE, NO TURKISH STATE WHICH DOES NOT ACCEPT THIS. Those who wanted to protest the events in Egypt gathered at the Fatih mosque. After performing the afternoon prayer, protestors walked to Sarachane Park with Islamic Union slogans. ADNAN OKTAR: Muslim troops should enter Syria from 70 different points with 70 division –or brigades- and the problem there will end in no more than 70 hours. It will be completely done. It will be solved in Syria, outside Syria, all this pain will all be over. They understand that this is the solution, but pretend not to see it. It is very easy to do, tough. It will guarantee that there is no loss of lives. This is the only solution to end the pain once and for all. Another reason why this would be great is that they would get used to the concept of Islamic Union. They will see that, when they act together they can easily solve their problems. ADNAN OKTAR: You can’t gain anything by bombing people. They should just stop doing that. The only way to stop Asad is Islamic countries coming together, and entering the country all together. They should do it as a land operation, from 70 different points. The chiefs of staff of Islamic countries can come together to form a command unit. This is what common sense requires, they can make joint decisions with this council. After setting up this council, Muslim troops should enter the country from seventy different points. And it will be over immediately. Especially, if Turkey and Iran join, it will be solved very quickly. Right away. Otherwise, bloodshed will continue for no reason. It will be a huge mistake. The participation of Iran army is especially important. Iranian army should lend 50 thousand people or not even that, one or two divisions would be enough. One division from Turkey, one from Pakistan, one from each country, or one brigade from each. Morocco, Tunisia and Algeria should send troops too. Anyway if Turkey and Iran send troops, the others will just follow suit. It is just about starting it. The same goes for the Egyptian army as well. When all Islam countries send one division, it will be immediately over. What can Assad do to that? He would surrender, immediately. Iran is his greatest supporter. If Iran sends troops, then it will be completely done. That’s very clear. Who can object to that? Otherwise, they will leave it to USA and UK and they won’t hesitate to use all their weapons. They will use all their rockets, all weapons, everything they have and completely raze Syria to ground, killing everything there. 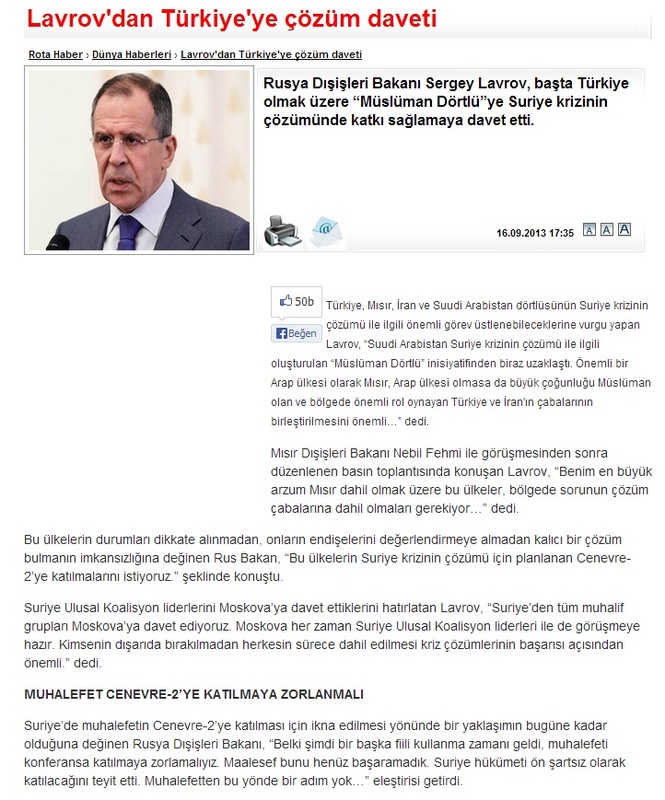 Sergey Lavrov, the Russian Foreign Affairs Minister, invited the ‘Muslim Four’, most notably Turkey, (Turkey, Egypt, Iran and Saudi Arabia) to contribute to the solution of the Syrian crisis. 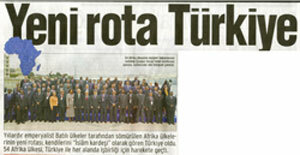 The new route of African countries is Turkey who accepts them as ‘brothers in Islam’. 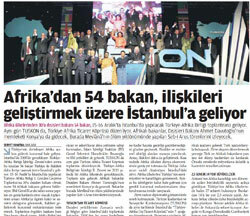 54 African countries have taken action to cooperate with Turkey on each field. 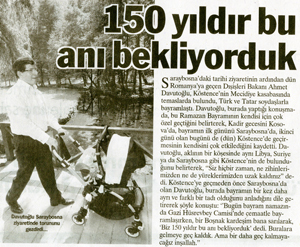 Adnan Oktar: This is indeed so natural. WE BELIEVE IN ONE RELIGION AND SPEAK ONE LANGUAGE. WE DO HAVE EVERYTHING IN COMMON. WE HAVE THE SAME ROOTS. WE ARE ACTUALLY BROTHERS, BUT WE ARE SEPARATE. Today, if we offer Azerbaijan to unite with us, they would accept without thinking a minute. Yet this should be offered on official grounds. So we can easily get united as one nation two states. THERE IS NO OBSTACLE, FOR SURE. EAST TURKISTAN WILL ALSO FEEL RELIEVED. ALL ISLAMIC WORLD WILL FEEL RELIEVED AS A RESULT OF THIS UNION… Turkey needs to put this forward. In other words, just give the name of it. Merely demanding it, will be enough for it to come true. Adnan Oktar: Syria wants to unite with Turkey, and Iraq. And if Syria and Iraq want it, so will everyone else. Azerbaijan wants it, and Armenia wants to unite with Turkey. Georgia wants it, so what else needs to be done? It is a union that will also include Lithuania. IT WILL BE A UNION THAT INCLUDES LITHUANIA, ARMENIA, GEORGIA, AZERBAIJAN, KYRGYZSTAN, TURKMENISTAN AND EAST TURKESTAN AND ALL OF THEM. AS FAR AS LIBYA. A TURKISH-ISLAMIC UNION WILL EMERGE THAT STRETCHES AS FAR AS THE COAST AND INTERIOR OF AFRICA. Turkey has prior experience, experience from the Ottoman Empire. And this time round, the errors of the Ottomans will not be repeated. The perfect aspects of the Ottomans will be adopted, but not their errors or deficient aspects, and a perfect union will result. 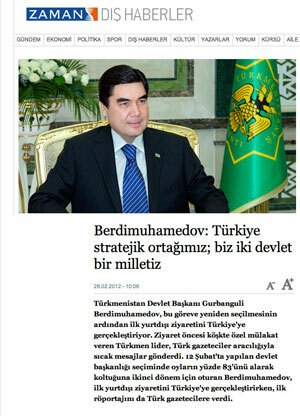 Gurbanguli Berdimuhamedov President of Turkmenistan is paying his first visit to Turkey after being re-elected as president. Before the visit he talked at the Presidential mansion and sent warm messages to Turkey by means of Turkish journalists. Turkmen President stated that he qualifies both countries as “two states but one nation” and expressed that Turkish Republic is Turkmenistan’s strategic partner. He defined the relationship between the two countries is based on mutual respect, trust and a beneficial cooperation that has equal rights. “Brother Turkish Republic is Turkmenistan’s reliable cooperation partner,” he said. Adnan Oktar: They see that Turkey is passing through a difficult period. They see the actions of the PKK and of the others. They see the activities going on in the schools and in the Southeast; and they also see how those put the government through hardship. In such an environment, would a person act soothing or would they act like them? Why shouldn’t my Alawite brother learn about religion? He should learn Christianity, Judaism, Islam and he should also learn what the Twelvers, Sunni, Shia and Wahabi sects are. He should learn what communism is and what fascism is. One should not fear general culture and knowledge. I am asking where you can go by ordering ‘do not learn this, do not learn that; boycott it or boycott that’? Adnan Oktar: Our nation is very good-natured, our nation is easygoing, modest, and our people do not like commotion. The Turkish nation has lived Islam in a perfect way since the Ottoman times. Turkish nation is very noble, very reasonable. You mentioned the Alevi-Sunni disunity. Let Alevis imagine there are many Hazrat Alis, many Hazrat Abu Bakrs around themselves. Let Sunnis imagine that there are many Hazrat Abu Bakrs and Hazrat Alis. Was there a conflict between Alevis and Sunnis in the days of Hazrat Abu Bakr and Hazrat Ali? There are many Hazrat Abu Bakrs and Hazrat Alis every where. We embrace each other, we are brothers. In no way is there such a problem. Let them [the ones who try to separate Alewites and Sunnis] do whatever they can. They cannot do anything. Alewites are brave, they are men of integrity. They all like lions. These people are the cement of Turkey, they are pure blood Turkish, let me tell you this as an extra information about them. Alewites are very strong and upright. Our Sunni brothers are like that too, they are very fastidious, as are the Alewites. There is no disunity between us. Adnan Oktar: Those things will interlock each other Insha’Allah, THOSE WILL INTENSIFY THE BROTHERHOOD BONDS VERY MUCH, we are approaching through a ceremony which is joyful, agreeable Insha’Allah. The sign of those; the appearance of Hazrat Mahdi (pbuh) is imminent; the descent of Jesus (pbuh) is also imminent Insha’Allah. THERE WILL BE AN AGREEABLE TOGETHERNESS. I WANT FROM MY SUNNI, SHIAH BROTHERS TO CONSOLIDATE THE BROTHERHOOD RIGOROUSLY, TO CONSTITUTE A VERY AGREEABLE BROTHERHOOD BOND. THE JAFARITES ARE EXTREMELY PIOUS, SUNNIS ARE PIOUS, ALAWITES ARE PIOUS. ARABS ARE OUR DEAR BROTHERS, THEY ARE THE DESCENDANTS OF OUR PROPHET MUHAMMAD (MAY ALLAH BLESS HIM AND GRANT HIM PEACE). KURDISH PEOPLE ARE OUR DEAR BROTHERS. The Christians living over there are the people of the Book. All of them are our brothers and sisters. We shouldn’t be separated. Adnan Oktar: Leftist-rightist, ALAWITE, KURDISH, LAZ, CIRCASSIAN, SUNNI; IT DOES NOT MATTER, WE ARE ALL BROTHERS, WE ARE ALL SERVANTS OF Allah. Allah has showed our paths, we will respect everyone’s ideas but unity and solidarity are essential. Those who love Allah, those who act in the way of Allah will surely make effort for the betterment of this country and they will do so. Turkey will Insha’Allah pursue the goal of the Turkish Islamic Union with success. Prof. Dr. Mehmet Gormez, Director, Presidency of Religious Affairs of Republic of Turkey, said that what interlocks each other is we are brothers and sisters in terms of faith. “There is no god but Allah and Muhammad (may Allah bless him and grant him peace) is the Messenger of Allah. This saying makes us brothers and sisters. It removes the separations such as race and color.” Prof. Gormez stated. 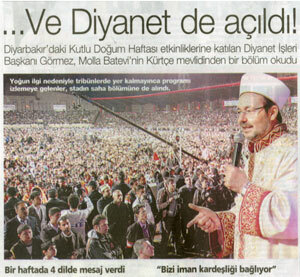 Ten thousands of citizens participated in the Qur’an Festival organized by the Office of the Mufti in Diyarbakir at Ataturk Stadium. ADNAN OKTAR: It doesn’t matter. We are all brothers and sisters. Otherwise it will strengthen the enemy’s hand. Love and affection toward a genuine Christian or a genuine Jew is of the greatest importance. ALLAH ENTRUSTS THEM TO US, AND THEY BELIEVE IN THE SAME ALLAH. THEY LOVE THE SAME PROPHETS. A SPIRIT OF AFFECTION TOWARD THEM IS MOST IMPORTANT. There are some people who look at them with hatred and ambition. That is incompatible with the Qur’an. It is incompatible with the Sunnah of our Prophet (may Allah bless him and grant him peace). Jews lived very comfortably in the time of our Prophet (may Allah bless him and grant him peace). Christians were also very comfortable... One can eat their food. One can marry those people’s daughters. One can go to their homes and stay overnight. One can talk to them. They are also servants created by Allah. Allah has created them like that in destiny. Adnan Oktar: In 1800s, there was no information, no culture, no research. We are now in the era of Internet. There are books, CDs and people’s minds are wide open. They know a lot and now we merely laugh at those enmities and consider them to be very irrational….If we approach the matters with the mind of 1800s, we can accomplish no results. THE RATIONALE OF THE 1800s WILL DISAPPEAR. WE SHOULD BY NOW ENTER THE BEAUTIFUL, LOVING, UNIFYING RATIONALE OF THE 2000s. Our age is the Golden Age. We are entering an age when the Turkish-Islamic Union will be established and the entire world will live in bliss. Those dark ages have remained in the past; those times of the cold war, the detonation of atom bombs, the extermination of millions of people, prison camps. Such a picture is infamy. We will forget this infamy. This is a shame of the past times, a sin peculiar to them. We are not of the same mind. We believe that they have gone wrong. They have made grave mistakes. Adnan Oktar:Those things will interlock each other Insha’Allah, THOSE WILL INTENSIFY THE BROTHERHOOD BONDS VERY MUCH, we are approaching through a ceremony which is joyful, agreeable Insha’Allah. The sign of those; the appearance of Hazrat Mahdi (pbuh) is imminent; the descent of Jesus (pbuh) is also imminent Insha’Allah. THERE WILL BE AN AGREEABLE TOGETHERNESS. I WANT FROM MY SUNNI, SHIAH BROTHERS TO CONSOLIDATE THE BROTHERHOOD RIGOROUSLY, TO CONSTITUTE A VERY AGREEABLE BROTHERHOOD BOND. THE JAFARITES ARE EXTREMELY PIOUS, SUNNIS ARE PIOUS, ALAWITES ARE PIOUS. ARABS ARE OUR DEAR BROTHERS, THEY ARE THE DESCENDANTS OF OUR PROPHET MUHAMMAD (MAY ALLAH BLESS HIM AND GRANT HIM PEACE). KURDISH PEOPLE ARE OUR DEAR BROTHERS.The Christians living over there are the people of the Book. All of them are our brothers and sisters. We shouldn’t be separated. Adnan Oktar: The commands regarding the People of the Book are set out very clearly in the Qur’an. And the actions and Sunnah of our Prophet (may Allah bless him and grant him peace) are also very clear. The People of the Book are our brothers. Armenians, Jews, the Orthodox, Protestants, the Christian world, in other words, are all our brothers. We believe in the same Allah. Allah is the same Allah in the Judaic world, the Christian world and Islam. They all have the same basic beliefs, for which reason the existence of the people of the book is a blessing. In other words, it is a great blessing that they are not irreligious or part of some other heretical movement, but are actually the people of the book. There is nothing to alarm Muslims in this; it is perfectly reasonable. Because, in the Qur’an Allah says that the People of the Book exist. They will do good things and Muslims will do good things. Living with them as brothers and sisters, having dialogues with them and eating together. A Muslim can marry a Christian or Jewish girl. In other words, they are the people whom we can share social life and rely on. When a woman becomes a man’s wife, gives birth to children and stays within the same family that means they have a strong bond of love and comradeship between each other. Adnan Oktar: By Allah’s leave, Turkey will be a great country. The Turkish-Islamic Union will be established.Turkey will embrace the whole of the Middle East andTHE WHOLE OF THE BALKANS, Asia WITH AN OLDER BROTHER SPIRIT, INSHA’ALLAH.And an excellent system will emerge. The Caucasian pact is being set up and there is a railway project, as you know. There are petrol and natural gas pipeline projects. Islamic Union meetings are being held. There is work to make Turkish Union stronger. These things are all auspicious, Insha’Allah. Anatolia has always been the cradle of civilization, you know. That was also so in Ottoman times. THEY ADMINISTERED THE WHOLE OF THE MIDDLE EAST, THE BALKANS AND THREE CONTINENTS FROM HERE. THAT IS HOW IT WILL BE AGAIN, BUT WITH A SPIRIT OF LOVE, FRIENDSHIP AND BROTHERHOOD. Adnan Oktar:THE BALKANS HAS ALWAYS BEEN OTTOMAN SOIL up until the inlands of Italy.Up until the vicinity of Italy, the whole region was the land of Ottomans.EVERYWHERE YOU SEE THE SIGNS OF OTTOMANS, THE BEAUTY OF OTTOMANS. THOSE PLACES WILL BECOME A CITY OF PEACE, A TERRITORY OF PEACE WITHIN TURKISH ISLAMIC UNION… Turkish Islamic Union will offer them only abundance, richness and peace. Turkish Islamic Union will offer peace and happiness to everywhere including Bosnia and Albania Insha’Allah. Turkish Foreign Minister Ahmet Davutoglu on Friday attended a fast-breaking dinner hosted in his honor by his Kosovar counterpart, Enver Hoxhaj, in Pristina. Speaking at the dinner, Davutoglu said Turkey and Kosovo were tied to each other with a history of 600 years, adding that he felt home in Kosovo. "It would be the same atmosphere if I had this dinner back in Turkey, in Konya, in Bursa or in Edirne,"
As part of his contacts in Kosovo, Davutoglu also met Friday with Kosovar Deputy Prime Minister Edita Tahiri. Adnan Oktar: TURKEY IS A GENUINE MODEL COUNTRY FOR THE ISLAMIC WORLD. IN OTHER WORDS, IT EXCELLENTLY UNDERSTANDS AND IMPLEMENTS TURKISH NATIONALISM, EXCELLENTLY UNDERSTANDS AND IMPLEMENTS ISLAM, AND ALSO POSSESSES THE TYPE OF STRUCTURE THAT INTERNALIZES SECULARISM. But all Islamic countries agree that it is the country that best practices and lives by Islam. Turkey is punctilious when it comes to cleanliness, understanding, life style and piety. This may be a legacy from the Ottoman Empire, the influence of Ottoman scholars. Allah produces this in the most excellent way, which is why I think Turkey is the country best suited to the leadership of the Turkish-Islamic world. Adnan Oktar: The conception of Islam set out and applied by Turkeyis an excellent model for Europe. Europe regards Turkey as very excellent and useful in that area, it also considers the way Islam is lived as ideal for the world. This has already produced a complete solution to the question. Presidency of Religious Affairs of Turkey paid an official visit to Beijing, capital city of China and signed a protocol with Vang Cuoan, China’s President of Religious Affairs Institution, involving the topics as religious training, faith services, religious publication and hajj. According to the protocol, the Muslims living in China are now allowed to send their children to Turkey to attend religious vocational high schools, divinity faculties as well as study for master degree and doctorate. 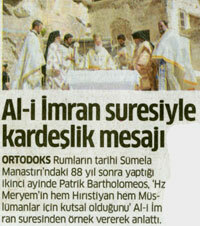 The Presidency of Religious Affairs of Turkey will cover all expenses as the protocol reads. 50 thousand imams (the religious leaders of the mosques) working at 40 thousand mosques in China can also be sent to Turkey to receive in-service trainings. 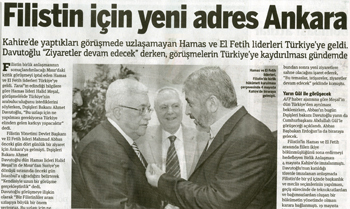 Adnan Oktar: For once there are divisions of land in Palestine, right? They are divided in small, tiny pieces. They must be united, because it is very important, now if –may Allah forbid- Konya were separated from us and there were something else in between, no way. All of them must be united. SECONDLY, THE MORAL DIVISION MUST BE AVOIDED; HAMAS AND PALESTINE FREEDOM ORGANIZATION SHOULD BE LIKE IN A SINGLE BODY. BECAUSE OUR ALLAH IS THE SAME, OUR BOOK IS THE SAME; WE ARE BROTHERS AND SISTERS. AND ALSO AS A RACE THEY ARE ONE, THEY ARE ALL SONS OF ISHMAEL. Adnan Oktar: IF TURKEY TAKES THE ROLE OF THE ELDER BROTHER, IT WILL FACE NO OPPOSITION THROUGH THE GEOGRAPHY including the people of Shia, Jafaris, Saudis and Iranians. 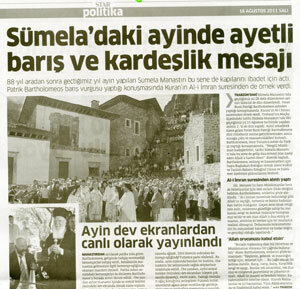 For example, when Mr. Ahmadinejad was here in Turkey, he performed his prayer in a Sunni mosque behind a Sunni imam. What does that mean? Clearly, this means that; ‘if you become the leader I will accept it’. Openly he said: “I gave a significant political message here.” What else was he supposed to say? Hezbollah will also accept Turkey’s taking the lead. Everybody will accept it. I DO NOT SEE ANYBODY WHO WILL OPPOSE THE LEADERSHIP OF TURKEY THROUGH THIS GEOGRAPHY AS TURKEY IS A MODERATE, AFFECTIONATE AND SENSIBLE COUNTRY.TURKISH PEOPLE ARE RESPECTED, DECENT, SOPHISTICATED AND CULTIVATED. BESIDES TURKEY IS A COUNTRY WHO HAS EXERCISED THE AUTHORITY FOR AGES AS YOU KNOW. ITS EXPERIENCE HAS COME FROM THE TIMES OF OTTOMAN EMPIRE. TURKEY WILL APPEAR AS THE ELDER BROTHER OF ALL TURKIC AND ARAB COUNTRIES. Everybody will see this. Now, I am telling you that after a period of ten years I will definitely put my signature under these words of mine in person, Insha’Allah. Adnan Oktar: A Turkish-Islamic union under Turkish leadership will come into being, Insha’Allah, with the unification of the Turkish states and the assistance of the Turkish union. THIS WILL BE UNDER TURKISH LEADERSHIP, and we are already moving in that direction. The ideal state of affairs is for Turkey to be its leader. … This has long been a duty incumbent upon Turkey. Turkey has always assumed the effective leadership of the Turkish-Islamic world. IT MAKES THIS FELT EVERYWHERE. IT ACTS AS AN OLDER BROTHER EVERYWHERE, EITHER DIRECTLY OR INDIRECTLY. For example, Turkey became involved in the establishment of the Caucasian Alliance.TURKEY BECOMES A MEDIATOR when there are disagreements among the other countries.Leadership of Turkey can be seen in the implementation of projects such as natural gas and petroleum projects. Turkey is fulfilling this position without making an official announcement. This situation goes on and improves. Adnan Oktar: LET THE BORDERS OPEN, LET THE VISAS REPEAL, LET’S MERCHANDISE ABUNDANTLY, LET’S EMBRACE THEM, LET THE JOY AND FESTIVAL BEGIN, LET THE BLESSING AND ABUNDANCE COVER ALL AROUND THE WORLD. Let the world see the evil in treachery, selfishness and let them resemble us. A bilateral agreement between Turkey and Ecuador to eliminate visa requirements has come into effect, granting citizens the right to travel between the two nations without obtaining a tourist visa. 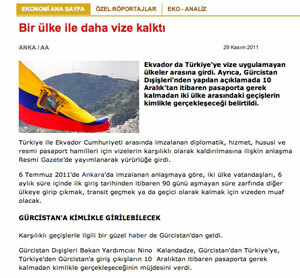 Foreign Minister Ahmet Davutoğlu and Ecuadorian Deputy Foreign Minister Rafael Lopez signed the agreement in Ankara on July 6th, 2011. Adnan Oktar: The commands regarding the People of the Book are set out very clearly in the Qur’an. And the actions and Sunnah of our Prophet (may Allah bless him and grant him peace) are also very clear. THE PEOPLE OF THE BOOK ARE OUR BROTHERS. ARMENIANS, JEWS, THE ORTHODOX, PROTESTANTS, THE CHRISTIAN WORLD, IN OTHER WORDS, ARE ALL OUR BROTHERS. WE BELIEVE IN THE SAME ALLAH. ALLAH IS THE SAME ALLAH IN THE JUDAIC WORLD, THE CHRISTIAN WORLD AND ISLAM. THEY ALL HAVE THE SAME BASIC BELIEFS, FOR WHICH REASON THE EXISTENCE OF THE PEOPLE OF THE BOOK IS A BLESSING. IN OTHER WORDS, IT IS A GREAT BLESSING THAT THEY ARE NOT IRRELIGIOUS OR PART OF SOME OTHER HERETICAL MOVEMENT, BUT ARE ACTUALLY THE PEOPLE OF THE BOOK. There is nothing to alarm Muslims in this; it is perfectly reasonable. Because, in the Qur’an Allah says that the People of the Book exist. They will do good things and Muslims will do good things. In the United States, the Christian, Muslim and Jewish religious scholars attended a religious ceremony at more than 70 churches on Sunday. They give the world a message of compassion by reading passages from the Holy Books and prayed together. For the very first time in U.S, the religious scholars of three divine religions came together to pray and gave messages of compassion at more than 70 churches in 32 states. Adnan Oktar: Under the leadership of Turkey,Insha’Allah a Turkish Islamic Union will be established with the aid of the Turkish Union that will come into existence with the unison of the Turkish states. 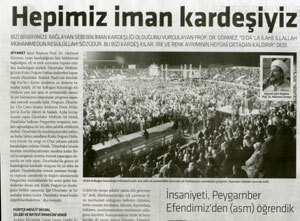 This will happen under the leadership of Turkey; we are actually proceeding towards this step by step. The leadership of Turkey is the most ideal. Every country will exist on its own as a state but there will be a spiritual union Insha’Allah as in the case of the European Union. The passports will be removed, the requirement for visa will be eliminated, the countries will make trade readily and they will become brothers. In order to accomplish this, the first basis will Insha’Allah be laid with Azerbaijan. And also with Syria, one of the Islamic countries. Azerbaijan is a country which is both Turkish and Muslim.Syria is also our Muslim brother. We will insha’Allah unite with Syria, too. These will be the first steps. This is a process that will come true step by step. Turkish-Islamic Union will be formed in 10-15 years Insha’Allah. Adnan Oktar: SYRIA’S AMALGAMATION WITH TURKEY IS NOW A MATTER OF MOMENTS. Syria desires this very strongly, Turkey to act as older brother... They want Syria and Turkey to remain as separate states but to be in complete union. This is excellent. 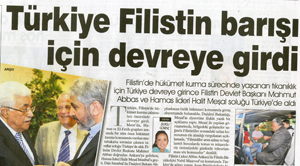 Of course there will be no division between us within the brotherhood of the Turkish-Islamic Union. Syria and Turkey will amalgamate Insha’Allah. This is a sign of that. We will be able to go to Syria with no passport or visa. And Syrians will be able to come and stay with us as they wish. We will be brothers, Insha’Allah. These things are signs of a delightful union. Khaled Sid Mohand, correspondent of Le Monde and one of the journalists who had to leave Damascus, said that the Syrians consider Turkey as the only hope. Berlin's Interior Minister Mr. Ehrhart Koerting participated in an Iftar (dinner to break fast), which was organized by Turkish Community of Berlin (Turkische Gemiende zu Berlin -TGB). In his speech during the Iftar, Koerting stated that Muslim community is an inseparable part of Berlin. Adnan Oktar: By Allah’s leave, Turkey will be a great country.The Turkish-Islamic Union will be established. Turkey will embrace the whole of the Middle East AND THE WHOLE OF THE BALKANS, Asia WITH AN OLDER BROTHER SPIRIT, INSHA’ALLAH. And an excellent system will emerge. The Caucasian pact is being set up and there is a railway project, as you know. There are petrol and natural gas pipeline projects. Islamic Union meetings are being held. There is work to make Turkish Union stronger. These things are all auspicious, Insha’Allah. Anatolia has always been the cradle of civilization, you know. That was also so in Ottoman times.THEY ADMINISTERED THE WHOLE OF THE MIDDLE EAST, THE BALKANS AND THREE CONTINENTS FROM HERE. THAT IS HOW IT WILL BE AGAIN, BUT WITH A SPIRIT OF LOVE, FRIENDSHIP AND BROTHERHOOD. Adnan Oktar: The Balkans has always been Ottoman soil up until the inlands of Italy. UP UNTIL THE VICINITY OF ITALY, THE WHOLE REGION WAS LAND OF OTTOMANS. EVERYWHERE YOU SEE THE SIGNS OF OTTOMANS, THE BEAUTY OF OTTOMANS. THOSE PLACES WILL BECOME A CITY OF PEACE, A TERRITORY OF PEACE WITHIN TURKISH ISLAMIC UNION… TURKISH ISLAMIC UNION WILL OFFER THEM ONLY ABUNDANCE, RICHNESS AND PEACE. Turkish Islamic Union. After paying a historical visit to Sarajevo, Turkish Foreign Minister Ahmet Davutoglu met with Romanian citizens of Turkish and Tatar origin in Mecidiye town of Constanta, Romania and participated in the celebrations of Ramadan Feast, Eid al-Fitr. Adnan Oktar: TURKEY IS A GENUINE MODEL COUNTRY FOR THE ISLAMIC WORLD. In other words, it excellently understands and implements Turkish nationalism, excellently understands and implements Islam, and also possesses the type of structure that internalizes secularism.But all Islamic countries agree that it is the country that best applies and lives by Islam. Turkey is punctilious when it comes to cleanliness, understanding, life style and piety. This may be a legacy from the Ottoman Empire, the influence of Ottoman scholars. Allah produces this in the most excellent way, which is why I think Turkey is the country best suited to the leadership of the Turkish-Islamic world. Adnan Oktar: Turkey is moving towards the Turkish-Islamic Union. Our moral values will be strengthened and we will also be more powerful in monetary terms, and BECOME THE SUPER STATE OF THE REGION; then there will be no Kurd problem or no Armenian problem or no Israel problem; all will be solved right from the root insha’Allah. Iraq will be under the control of Turkey insha’Allah, Syria will be under the control of Turkey insha’Allah, Azerbaijan will be under the control of Turkey; meaning Turkey will be their spiritual elder brother insha’Allah. Turkey will be their spiritual elder brother and assume a moral responsibility. Turkey will ensure the stability, peace and security of the region completely.Being the elder brother is the attribute of Turkey, SINCE THE OTTOMAN PERIOD SHE HAS BEEN THE ELDER BROTHER OF THE REGION, SECURING PEACE AND TRUST IN THE REGION. However, this time it will be perfect, it will be very beautiful, very auspicious and very good insha’Allah. Adnan Oktar: Of Course Turkey will be the leader of the Turkish Islamic world in the near future. There will be a great Turkish Islamic Union and this union leads Russia, China, Israel, Armenia and all other countries to richness and peace. There will be a great peace and justice rising all over. There will be a great beauty that loads people with joy, happiness. We call this golden age in the end times. We are heading for a gorgeous time; it will come true very soon. I hope this will come true in 10-15 years, Insha’Allah. Adnan Oktar:We are the elder brother and close friend of the whole region. All of them are our neighbors, since thousands of years, we lived hundreds of years nested. The separation is entirely artificial.LET THE BORDERS OPEN, LET THE VISAS REPEAL, LET’S MERCHANDISE ABUNDANTLY, LET’S EMBRACE THEM, LET THE JOY AND FESTIVAL BEGIN, LET THE BLESSING AND ABUNDANCE COVER ALL AROUND THE WORLD. Let the world see the evil in treachery, selfishness and let them resemble us. Foreign Minister of Belarus Sergei Martynov said that works on lifting visa procedure had been completed and Turkish Foreign Minister Ahmet Davutgolu was invited to Minsk to sign the agreement on visa procedure. Adnan Oktar: Turkey is a genuine model country for the Islamic world. In other words, it excellently understands and implements Turkish nationalism, IT ALSO EXCELLENTLY UNDERSTANDS AND IMPLEMENTS ISLAM, AND ALSO POSSESSES THE TYPE OF STRUCTURE THAT INTERNALIZES SECULARISM. BUT ALL ISLAMIC COUNTRIES AGREE THAT IT IS THE COUNTRY THAT BEST APPLIES AND LIVES BY ISLAM. Turkey is punctilious when it comes to cleanliness, understanding, life style and piety. This may be a legacy from the Ottoman Empire, the influence of Ottoman scholars. Allah produces this in the most excellent way, which is why I think Turkey is the country best suited to the leadership of the Turkish-Islamic world. Adnan Oktar: The conception of Islam set out and applied by Turkey is an excellent model for Europe. Europe regards Turkey as very excellent and useful in that area, it also considers the way Islam is lived as ideal for the world. This has already produced a complete solution to the question. Under Turkish leadership, an enlightened, rational and genuine conception of Islam will rule the world, insha’Allah. While Egypt gets prepared for their parliamentary elections, the Muslim Brotherhood and the Liberals pledge their support to the preparation of a civil constitution. In Egypt, where there are preparations for Parliamentary elections following the toppling of Hosni Mubarak, dissension over a constitution broke out as it did in Turkey. Groups such as the Muslim Brotherhood and Liberals in the country also pledge support to the preparation of a civil constitution by the Parliament after the elections. Adnan Oktar: Allah protects the one who is brave, just and wise. This nation is brave, just and wise and will do what is necessary.These courageous and stouthearted leaps forward will carry on, and Turkey will defend Turkish-Islamic Union in the more undaunted and straight out manner; you will see that. Turkey will face up to pay the price for it and intrepidly express this.